A unique creole of Portuguese and Malay, with elements of Chinese languages such as Mandarin and Hokkien, it was spoken by at least 2,000 people across the Malayan archipelago at its peak in the 19th Century, according to Mr Wong. But today there may be as few as 50 fluent speakers left in Singapore, along with more in Malaysia where the language is also in decline. Where are England's steepest streets? The main reason for its decline is that its own community has come to see it as economically irrelevant. When the British ran Singapore and what is now Malaysia, many Portuguese Eurasians found work in the civil service. English therefore came to be seen as more important than Kristang, and many began to discourage their children from speaking it. Bernard Mesenas, 78, remembers being belted as a child by his father when he was caught speaking Kristang. "My father did not like it, he said I couldn't speak it because it would spoil my English," he told the BBC. "I would argue, 'But it's Grandma's tongue.' Then he would put his hands on his belt and I would hide behind my mother." When the British left, the newly independent countries of Malaysia and Singapore set about the task of deciding which languages spoken by their multicultural populations should be officially recognised - Kristang was not one of them. It continued to decline as Eurasians married other races, and their children spoke other languages. In Singapore, where every child must learn a second language after English, many Eurasians have chosen to learn Mandarin. Even in the Portuguese settlement of Malacca, the birthplace of Kristang and still home to a large Portuguese Eurasian community, the language is slowly fading away. Kristang researcher Prof Stefanie Pillai of the University of Malaya says many families have long tolerated their children speaking English. "Thus, sadly, even though you can hear the creole being spoken in the settlement... there are young people who grew up here but are not fluent in the creole, and instead are dominant speakers of English," she says. But Mr Wong and a group of language enthusiasts hope to change things. Their group, called Kodrah Kristang - "Awaken Kristang" - holds weekly free language classes. They aim to build a critical mass of fluent Kristang speakers who can pass it on to future generations. 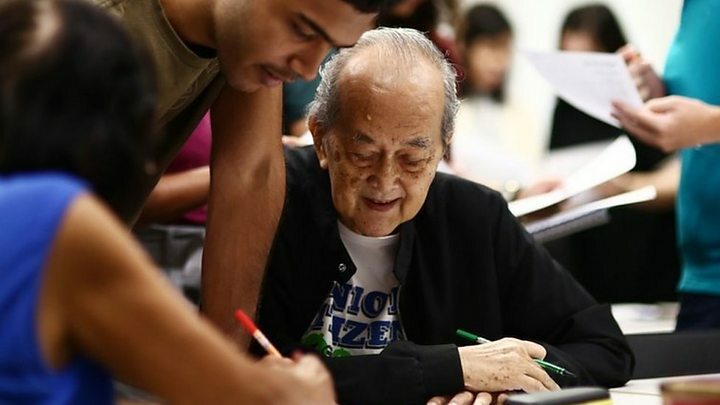 Each week, about 200 students - many of them Portuguese Eurasians - attend their classes. Among them are Mr Wong's own grandparents. The irony of learning their native tongue from their grandson is not lost on them. "It never dawned on me that Kristang was my language, I'd always thought it was English," says Mr Wong's 80-year-old grandmother Maureen. "I've missed it, I feel I should have learnt it better to speak it to my own children. "But it's not too late to learn," she adds. "And I think it's great that a younger person can teach an older person, especially when it's your grandchild." But reviving a dying language is not easy. One main challenge is that Kristang is mostly a spoken language and has rarely been recorded. There is no standardised spelling or pronunciation system - one word can have dozens of variations. The word for four, quartu, can be spelt and pronounced in 20 different ways. And because it has been in decline for so long, it has huge gaps in its vocabulary. Kristang does not have words for basic concepts such as apple, nurse, station or camera. "But we do have several words for genitalia," deadpans Mr Wong. To solve this problem, his group invented new words with mash-ups of Kristang's root languages. For instance, the Kristang word for apple is "manzang", an adaptation of the Portuguese word "maca" using a Malay linguistic rule. A panda is "bruangatu" or "bear cat", a translation of the Chinese term for panda using Malay words. Some of these linguistic inventions can take on a poetic bent - a camera is "pintalumezi" or "light-painting machine", while grammar is "osulingu", or "bones of language". The group has also organised visits to the Portuguese Settlement in Malacca, started work on a dictionary and textbook, created free online audio courses, and even done YouTube covers of pop songs in Kristang. In May they will hold the first ever Kristang festival called Festa, featuring talks, workshops and a heritage tour. In a welcome sign, the event has received Singapore government funding. They may still be a long way off from seeing Kristang become a living, breathing, widely spoken language again, but it's a first step. "One day we would like to see Kristang be recognised by the wider community," says Mr Wong. "There are no economic reasons for it to come back. But it's part of our shared historical fabric and heritage."